This page traces the history of Louisiana Ave. For information on various commercial buildings along Louisiana Ave., Louisiana Circle, and Library Lane, see the page under Houses and Buildings. 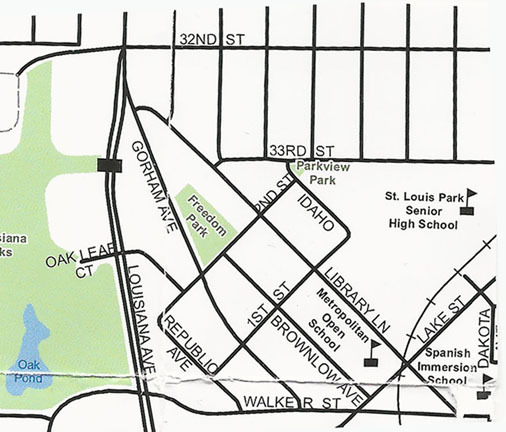 Louisiana Ave. was originally called Falvey Ave. before the city’s street names were changed in 1933. The Falveys were very early St. Louis Park residents. Very little was built on or west of Louisiana before the end of World War II. Although today the street is a main artery, stretching from I-394 to Excelsior Blvd., it was actually built in several stages. It is a bit difficult to track its progress because maps published in the annual directories didn’t always keep up with the activity. The 1889 map shows that Falvey Ave., which sits on a section line, existed between present-day 22nd Street and Minnetonka Blvd. Northside Rotary Park now sits at the northwest boundary. As early as 1914, the road had been built all the way from Highway 12 south to 32nd Street. At that point it turned to the southeast, ending at Walker Street. It couldn’t go straight south the way it does now because the land was platted such that the streets were sideways. In addition, the property was occupied by factories, and in 1917 it would become the Creosote Plant. There was a bridge over the Great Northern tracks between Minnetonka Blvd. and Cedar Lake Road as early as 1937, as evidenced by an aerial map. The wooden bridge burned in 1970 but was rebuilt one side at a time so traffic was not completely shut down. The section south of the Milwaukee Road/M&SL tracks between Oxford and Minnehaha Creek must have been built by 1960, since that is when the buildings on Louisiana Circle were built. A 1964 map does show this segment completed. 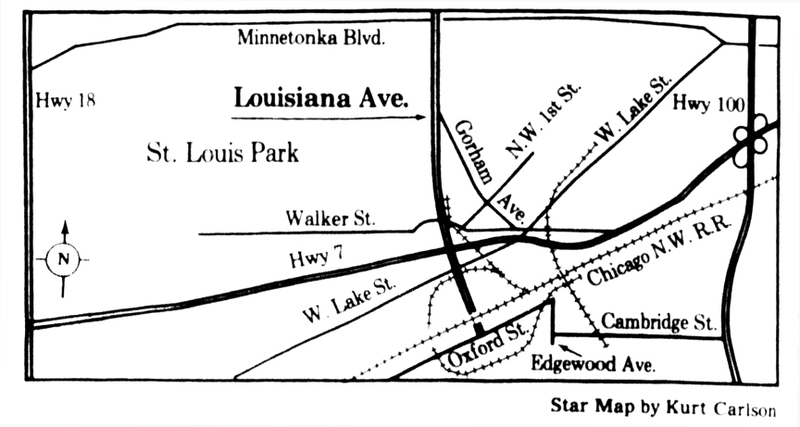 The 1964 map shows a short section of road on the south side of Highway 7, from Lake Street to the railroad tracks. Sometimes it is labeled Louisiana and sometimes it is called Hurst. It appears that this segment is part of present-day Louisiana. At the time the road turned west into South Street, but didn’t connect with Taft or the rest of South Street (which became Edgebrook). By 1970 the section south of the railroad tracks connects Oxford to Excelsior Blvd. Once the Creosote Plant was gone, Louisiana was built straight through it. The southeastern stretch between 32nd and Walker Street was renamed Library Lane. After clean-up [of the pollution], the two-lane section of Louisiana from Lake Street [aka Minnetonka Blvd.] to Walker Street will be made into a four-lane divided highway. We know now that only a portion of Louisiana was made into four lanes. A plan to widen the entire road was abandoned, but only after the old Park Tavern at Louisiana and Minnetonka Blvd. was demolished in anticipation of construction. In 2013, construction started on a new interchange at Louisiana and Highway 7. The project eliminated the traffic light, created entrance and exit ramps onto Highway 7, and created three roundabouts at ramp endings on Louisiana Ave. and the intersection of Louisiana and Walker Street.